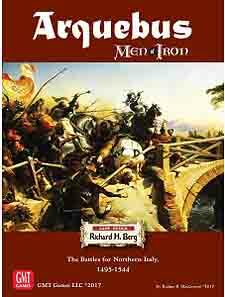 The Men of Iron series takes you to one of the crucibles of modern medieval warfare - Northern Italy. Here, over a fifty year period, medieval warfare evolved from the dominance of heavy cavalry and the dense Swiss pike-armed formations to the pre-eminence of the Landsknechts. Gone were the days when these dense pike formations could break opposing lines with impunity. Even the primitive arquebus could inflict grievous casualties on the tightly-packed pikemen. Arquebus uses the popular Men of Iron mechanics with much concentration on detail of weaponry, from the differences between closed formation and open, to the strengths and weaknesses of the Swiss and the German Landsknecht, the major force of warfare of the era. Arquebus shows all of this in true die-rolling glory, featuring 8 major battles: Fornovo, Cerignola, Agnadello, Ravenna, Marignano, Bicocca, Pavia, and Ceresole. These are all really great game-players, will all but two of them half-mappers playable in 3 hours or less. The other two are the 'tiny' page-sized (8" x 11") Cerignola and the big one-mapper, the final battle of Pavia. Pavia was a crushing defeat wherein France lost over 50% of its army and almost all of its nobility of command, including her king, Francis I, who was captured. But for gamers, Pavia is wonderful gameplay, with units all over the greatly detailed map, much manoeuvre, and many tough decisions to make.